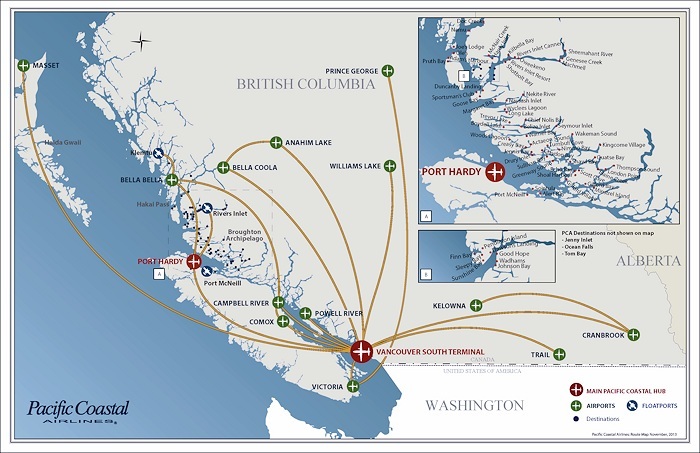 Pacific Coastal Airlines, Daily Scheduled flights between Vancouver and Cranbrook, Williams Lake, Victoria, Comox, Campbell River, Powell River, Port Hardy, Bella Coola & Klemtu, British Columbia. Pacific Coastal Airlines is a well-established name in British Columbia operating in over 14 bases and flying a total of 21 aircraft. For over forty years Pacific Coastal Airlines have successfully expanded flights in the coastal and interior regions of BC. We've been serving the traveling public with a smile since 1975. Pacific Coastal Airlines provides regular schedule, charter, and cargo services to 65+ destinations in British Columbia, more than any other airline. We are the sixth largest airline operating at Vancouver International Airport (YVR) based on total outbound seats, and third largest based on take offs and landings. Our fleet of aircraft provide scheduled service throughout BC with flights between Vancouver to Victoria, Comox, Campbell River, Powell River, Port Hardy, Bella Bella, Bella Coola, Cranbrook, Williams Lake, Prince George, Masset, Trail, Anahim Lake, Rivers Inlet, and Hakai Pass. Pacific Coastal Airlines utilizes the South Terminal located at the Vancouver International Airport; known for its ease of use and convenience, the South Terminal has become a favorite with travelers trying to avoid the congestion of the Main Terminal. Parking is also conveniently located across from the South Terminal Building. Pacific Coastal Airlines handles a wide variety of appropriately packaged goods on all flights. From our economical general cargo service to our premium guaranteed air cargo, Pacific Coastal can organize freight services to fit your needs. We offer airport-to-airport service as well as door-to-door delivery services to anywhere in Canada 24/7. For frequent travellers who want the freedom of full fare at a reduced price ask about Quik Pass. Benefits also include discounted car rental and more. For more information please visit pacificcoastal.com. by calling Pacific Coastal Airlines at 1-800-663-2872 or 604-273-8666. You will be glad you did!